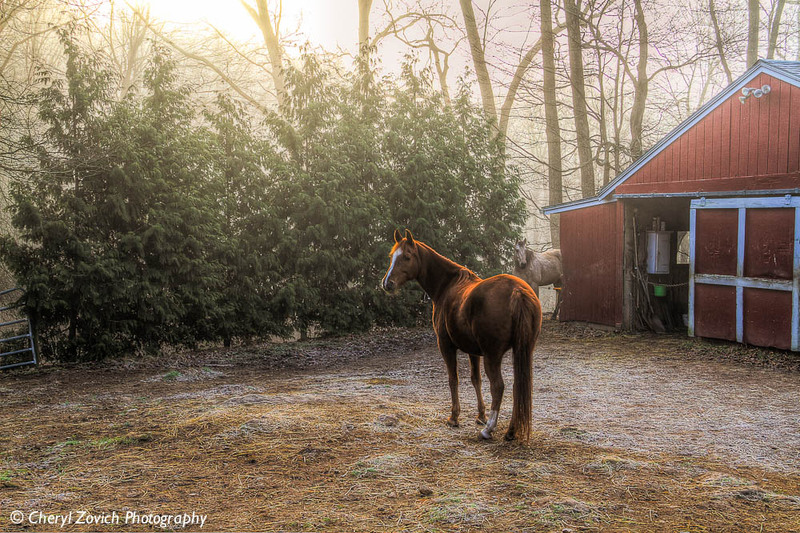 Waiting for hay on a foggy morning. I love this picture of Hazer. It’s technically not a great photo, but it has a haunting quality to it that I like. I think it captures Hazer’s personality well; the distant, detached aloofness I’ve struggled to embrace his entire life. Having a new puppy has made me look back at all the oddness I’ve lived through with Hazer. I suppose when you’re caught up in the moment you can’t really see things with the same clarity that you do with hindsight. I’ve always had a strong suspicion that Hazer was …. well, not quite all there. He’s bright, make no mistake about that, but his inner compass appears to be slightly damaged. I tried giving him lots of structure, but that didn’t help. We did all kinds of classes and training together. He quickly mastered just about any task you asked of him, but he hated the stress of being off the farm. 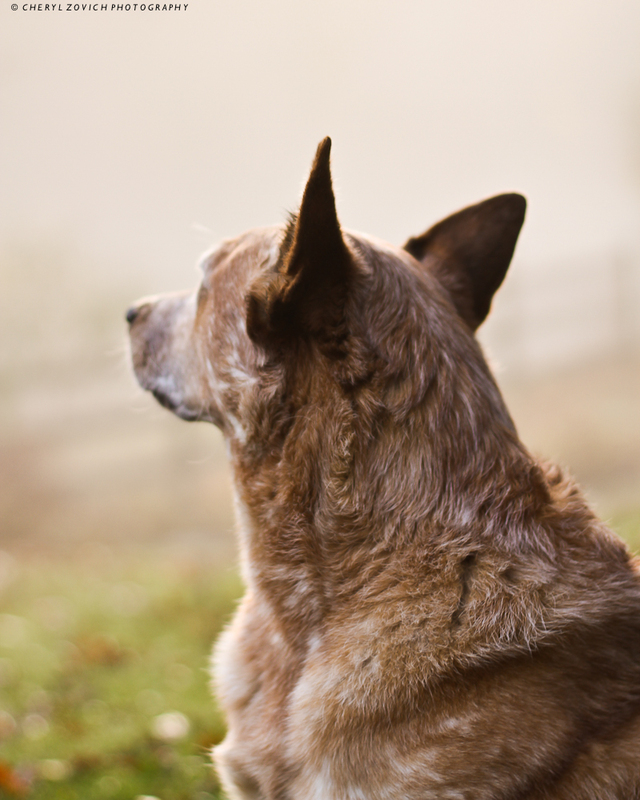 It took several years, but I finally came to the realization that he was simply a great farm dog and trying to mold Hazer into anything more was going to be an exercise in frustration. Hazer isn’t an easy or even a particularly fun dog to live with. He’s insecure, vocal and somewhat pushy. We don’t feed into his neurosis, but oftentimes his “stuff” encroaches on our daily lives. Most of all, Hazer doesn’t want anybody to have any fun. Ever. He’s an extremely serious dog whose sense of humor borders on bizarre. Needless to say, having a new puppy throws a monkey wrench into Hazer’s neat, structured world and he’s not too sure he likes that. Every chance he can get he tries to squash the “fun” out of Gus. Fortunately, Gus doesn’t take Hazer’s stiff upper lip too seriously; he just runs off and makes his own fun elsewhere! But that bugs Hazer too. With all his faults and his fondness for making life difficult, you’d think I’d love Hazer a little less than my other dogs. I don’t. Hazer frustrates and challenges me daily, but I can’t look at him without feeling my heart melt just a little. And I can’t explain why. Hazer’s very precious to me, perhaps because he’s so darn hard to love. Although my emotions range from love to hate and every nuance in-between, Hazer will always have a firm grasp on my heart. He’s my “special” boy. 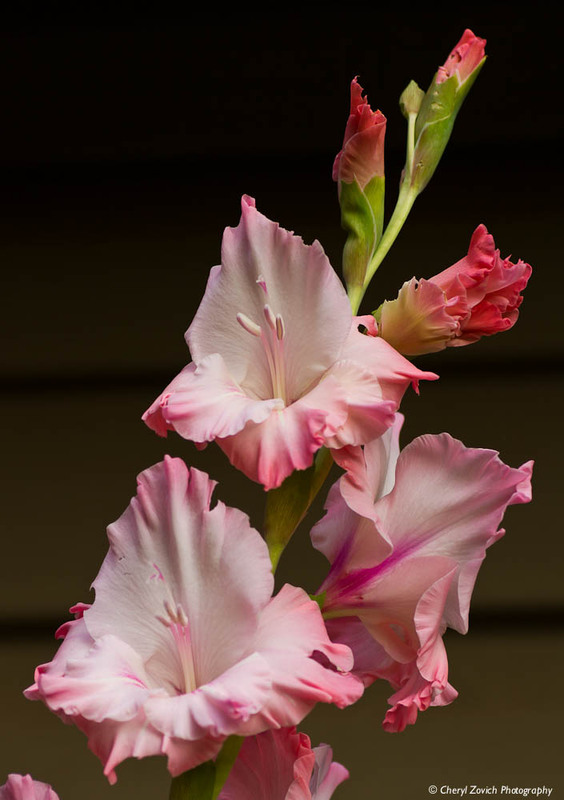 My gladiolas have finally bloomed. 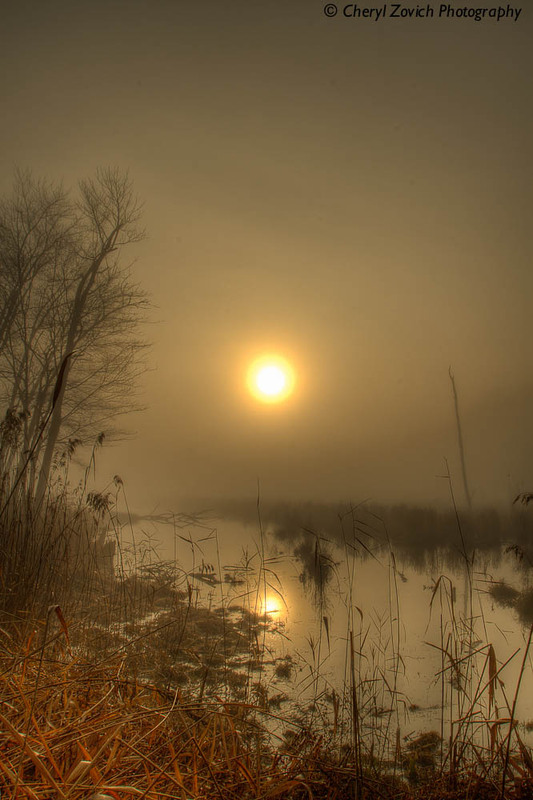 I shot this in early morning fog, which has been very heavy lately. 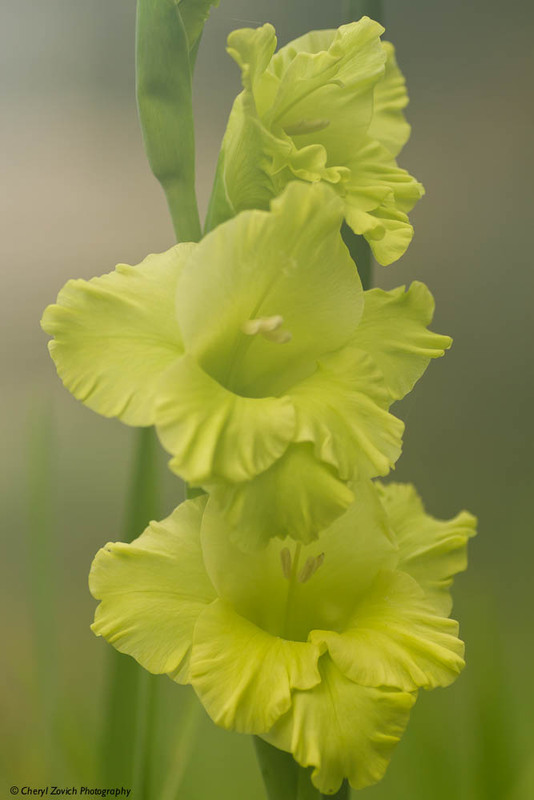 I didn’t think I’d like the green glads, but now that they’ve blossomed I think they look better than they did in the picture on the bulb bag. I bought a handful of glad bulbs pretty late in the spring and the color selection was limited to red, pink and green. That wouldn’t have been my first choice, but planting glads was a bit of an after thought. Next year I’m going to try to get better colors and make sure I plant them earlier. It’s been years since I’ve grown gladiolas and I’d forgotten how much I like them. 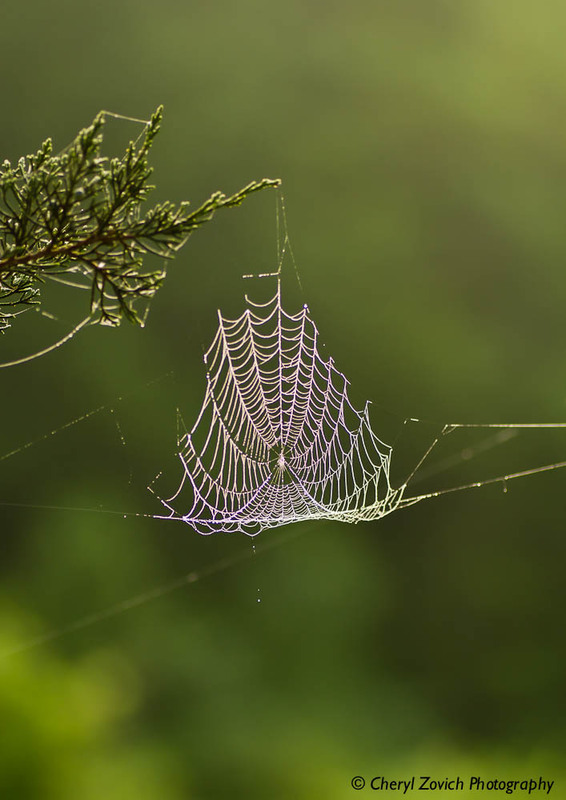 It was another foggy morning … good for shooting webs. I didn’t have a lot of time to explore options today because I had things to do and Gus was waiting to come back out and go burn off a little energy. I took a few photos, then set my camera and tripod aside. The whole time I was shooting the horses were patiently grazing in the side pasture by the barn, but as I approached them I suddenly spotted a HUGE web suspended between the two strands of electric fence! I quickly retrieved my camera and struggled to find a place that would support the tripod and allow a decent shot. 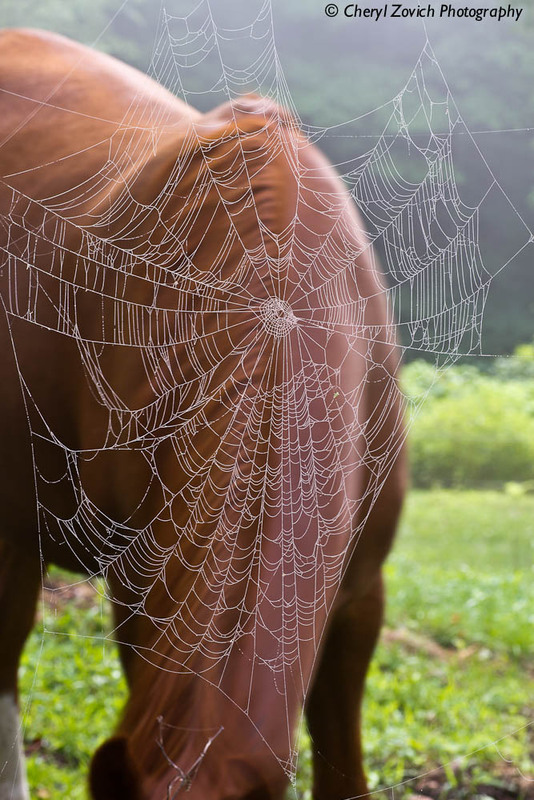 While I was doing this the horses continued to munch grass directly behind the web, which was so light-sensitive that if Dharla moved away from the fence the web just vanished into the fog. Naturally, almost as soon as I had things set up both horses got board and started to wander off, so I picked a couple of handfuls of green grass and tossed it over the fence. I hoped that would entice at least one of the horses to come back, preferably Dharla since she’s the darker of the two horses. It worked, and I was able to get a few interesting shots of the web with Dharla in the background for contrast. Things are starting to get super busy, but there’s nothing like a few weeks with daily temps in the 90’s to sap your energy. I’ve done my best just to soldier through it, but word has it that the next few days are going to be even hotter. Looks like morning and evening hose duty is going to be mandatory. I’ve planted several shrubs out by the new barn and if I don’t spend a good chunk of every day watering them, they’re going to fry. I’m hoping they’ll take, and by this time next summer I won’t have to do a thing with them. We still have some decisions to make about the stain for the barn. We both want something that will look as natural and barn-y as possible. We already have a red barn, so we’re not looking to repeat that hue. Ideally, I’d like the barn to look like it’s always been here, but who would think there’d be so many different shades and tones of “natural” to pick from? And let’s not forget about several kinds of opacity. Good grief! I’m not good at making that kind of decision and I always end up second guessing my choice until the project is done. However, we can’t stain with the temperatures this high, so I’ll have a little reprieve to torture myself with the final decision. 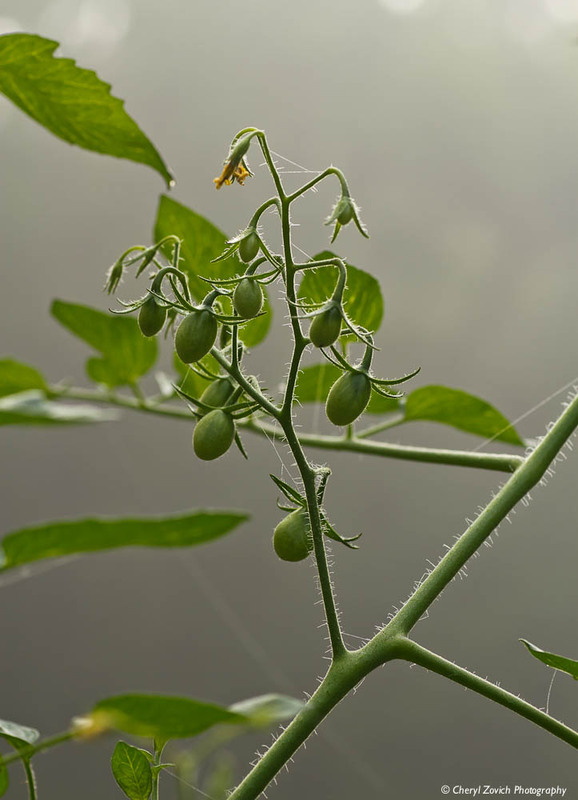 More exciting news and changes to come soon, but in the mean time I think I’m going to need a catcher’s mitt … like the spider web I shot one foggy morning this week. This is how I’ve been feeling lately: Hanging on by a thread. 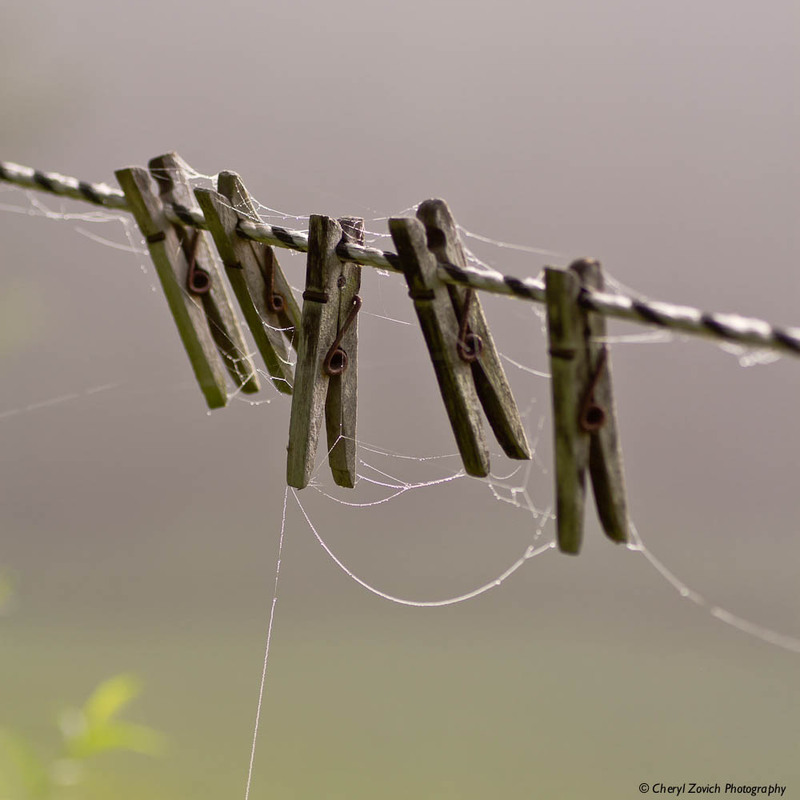 Hung out to dry. On the fence. Yup, this picture fits my mood well. If you stare at the clothes pin on the far right you can see how the world looks through my right eye. No biggie, I’ve got two eyes, right? Well, we’re not made to work that way. My right eye is my dominant eye, meaning, the image that gets sent from my left eye doesn’t travel to my brain as quickly as the image from my right eye. So my brain tries to focus on a fuzzy image first. Several nanoseconds later it stutters and goes, “Oh, that’s right. Wrong eye!” Then it picks up the somewhat clearer image on the left. But unless I close my right eye, the final image remains off balance. What my left eye sees is in focus, like the clothes pin in the very middle of the picture. What the right eye sees is dull and blurry, like the pin on the right. So if you stare at the pin in between the two, you’ll get a pretty good idea of what I see all the time; a messed up slightly in-focus, slightly out of focus view of the world! Needless to say, I haven’t been taking very many pictures. In some ways I’m OK with that, but in others its very frustrating. The longer my camera sits unused the harder it is to retain the fluency to use it when I’m ready to shoot again. So every now and then I push myself to get out and try to shoot something. I’ve pretty much come to rely on using live view, which limits my ability to take pictures of anything that could move suddenly, like horses and dogs. I try to stick with flowers and things of that sort. More often than not, I’ve found myself saying thank goodness for my Macro lens. OK, enough of the violins for now ….